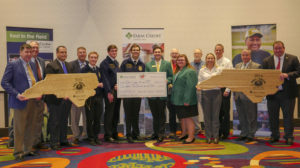 On Thursday, January 10, 2019, the CEO’s from AgCarolina Farm Credit, Cape Fear Farm Credit, and Carolina Farm Credit presented a check for $105,000 to North Carolina 4-H and FFA, which was raised through the 2018 Pull for Youth sporting clays events across North Carolina. The Pull for Youth events are another way the Farm Credit Associations of North Carolina are giving back to the future of agriculture throughout North Carolina. Funding received from the Pull for Youth events is being used to support 4-H and FFA programs in North Carolina. Thank you to the Farm Credit Associations for their generous support of these organizations and our youth! For more information about the Pull for Youth events, check out their website.